"Thank you very much. I did receive the Angel Ashes in excellent condition, it was boxed up well. 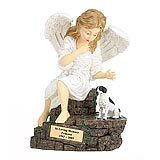 It is an outstanding memorial to my pet "Lea" whom I miss very much. Her passing has left a hole in my heart that will never heal but we had the best of times. Only time, memories, and the Angel Ashes urn will slowly ease the pain. My entire family, friends, and vet were all impressed with Angel Ashes. I sent pictures of the urn to my vet to keep and show others of a very fitting tribute for our special little friends whom we have lost. Thanks again for an excellent and outstanding memorial." 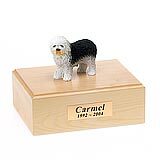 All available Old English Sheepdog dog urns and memorials will be displayed with the figurine on the Old English Sheepdog urn you select and in the appropriate size.